Have you ever thrown a party and run out of flatware? Even if you have plenty of pieces, you end up washing the entire set at the end of the night. That's no fun, either. Eliminate the frustrating cutlery clean-up and mess when you use our mini spoons instead of old-fashioned silverware. They're the perfect size for soups, desserts, and everything else you eat with a spoon. 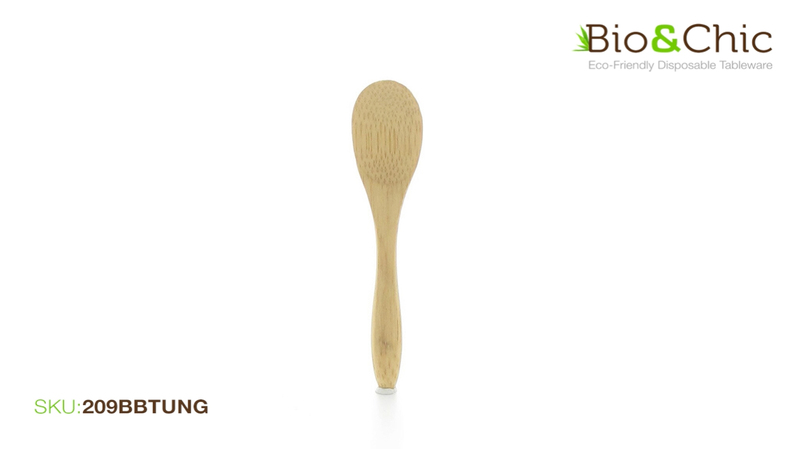 The difference is that a bamboo spoon is made from a sustainable material. Mini spoons made of bamboo feel at home in the microwave, which means it doesn't matter if you forget to remove the spoon before heating up your food. Grease won't cause this bamboo spoon to fall apart or become soggy. Dig into hot hors d'oeuvres, cold ice creams, and other small fairs. Best of all, once you're done, you can throw out or recycle your bamboo flatware. It decomposes rather than languishing in the landfill. There's a good reason why this piece was featured in Martha Stewart Weddings today! I purchased these spoons for my daughter in laws shower favors. They were the perfect size! Exactly as they were described on the website! Would not have a problem ordering from Bio and Chic again. Perfect for my sugar scrub! They are great quality and shipped quickly. This is my second time ordering from Bio & Chic and I will continue to order here! This was my first time to order with Bio and Chic. I received my order quickly and it is exactly what I was hoping it would be. Thank you! Great quality and price. You can't beat it. I ordered these for a bridal shower favor. They are just the cutest things ever! Also, practical. Can be used for scooping or stirring dips. My fiance and I are giving our guests infused sea salt in glass jars at our Oceanside wedding reception and these are the perfect finishing touch to the jars! Perfect size, so cute. Very cute, durable spoons. Better quality than I imagined. Love them! The spoon is exactly what I was looking for to add style and functionality to my products. I will be ordering again.